Could a new Xbox One controller be about to appear? 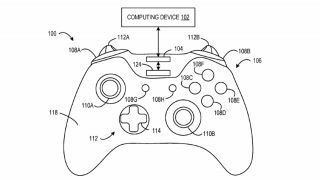 It seems Microsoft had two patents granted in December 2018 for a number of enhancements to the hardware of its Xbox One controller. Filed back in June 2017, the patents (here and here) are focused on improving feedback on the controller's left and right triggers, as well as the level of mechanical tension achieved when holding one down. So far, so jargon-heavy, but even small enhancements will play their part in ensuring smooth and responsive gameplay – whether you're shooting, sprinting, or cycling through menus with the Xbox One controller's triggers. The diagrams appear to relate to the Xbox One controller, rather than the jazzier Xbox One Elite controller, though any improvements to the button and trigger mechanics in one controller are likely to be rolled out in new iterations of the other. The Xbox One already has one of the most ergonomic (comfortable to hold) console controllers on the market. The console war between Xbox and PlayStation has gone on for years now. As much as the winner will be decided by console exclusives (PlayStation 4) or sheer processing power (Xbox One X), sometimes it's the small improvements and upgrades that make all the difference. With the next generation of Xbox consoles likely another couple of years off, though, we expect we'll be seeing more variation on the next generation of controllers than what we see here. PS4 vs Xbox One: which gaming console is better?